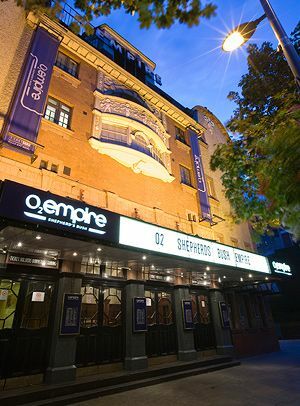 The O2 Shepherd's Bush Empire is arguably one of the few iconic music venues to become famous for something else: although it opened in 1903 as a variety theatre, between 1953 and 1991 it was the BBC TV Theatre, making it the national cradle of broadcast light entertainment. Since the early 90s it's returned to its roots as a live venue,with a penchant for surprise or warm-up gigs; despite a relatively modest capacity of 2000, the Rolling Stones and Page & Plant have each played here. The nearest Tube stations are Goldhawk Road (Circle/Hammersmith & City), Shepherd's Bush (Central) and Shepherd's Bush Market (Circle/Hammersmith & City); please note that none of these stations are equipped with lifts. The venue is served by the 72, 207, 220, 260, 283, 295, 607 and N207 buses. The nearest car park is in Westfield Shopping Centre, a few minutes' walk to the north. Indie-rock project of Phoebe Bridgers and Bright Eyes' Conor Oberst. GUN, FM, and Dan Reed Network celebrate the 30th anniversary of their 1989 albums Taking On The World, Tough It Out and Slam. Young Northampton singer-songwriter who cites Radiohead and Bright Eyes as influences. The Mercury-nominated London-based outfit presents its fusion of jazz, funk and electronica. The veteran rock quartet performs songs from their seventh studio album Hypercaffium Spazzinate, their first new material in over a decade. The Detroit rockers invite you to join the punky disco party as they power though hits Gay Bar and Danger! High Voltage. Dub, reggae and dance courtesy of the Leeds-based nine-piece. House and garage club night. Over-14s show. Rootsy pop songwriting duo Amy Ray and Emily Saliers. Multi-venue London festival bringing soul, jazz, blues, funks, reggae, hip hop, latin and world musicians to the city. Featuring Van Morrison, Kraftwerk Re:Werk, Aloe Blacc, Thievery Corporation, Mavis Staples, Stone Foundation and more on the bill. This London-resident singer-songwriter brings her own take on alternative rock to the stage with her original material. American singer-songwriter, musician, and actress, known for being the lead singer and rhythm guitarist of indie rock outfit Rilo Kiley. Her fourth solo album On the Line will be released spring 2019. The British singer-songwriter made famous for her vocals on other artists records tours her solo work after featuring on two number one hit singles, Clean Bandit's 'Rather Be' and Route 94's 'My Love'. The former bassist of the band Woods performs indie-folk rock material. The UK-born Canadian actor and singer performs his country music material. Ben Kissel, Marcus Parks and Henry Zebrowski discuss all things horror for their comedy podcast. The singer from San Fransisco, Ari Staprans Leff, brings his commercial pop tunes to the UK. Jeremy Zucker supports. Soul and R&B singer from North Carolina, who has been releasing music since the late 1960s, performs with his backing band. Louise Redknapp returns to the world of pop with new album Heavy Love and a UK tour. Willie Nelson's son leads this contemporary rock band who hail from California. The anthemic Welsh rockers return with new album Resistance is Futile. Irish singer and titan of crossover Celtic music who has released eleven studio albums. Aka English/Irish rapper/singer Michael Stafford, encroaching on Plan B's indie crooner territory. The men from 'Down Under' return. Full-on industrial metal band led by Al Jourgensen, who have been frightening small children since the days before small children started getting into all this nu-goth malarkey. Folk-rockers from Norwalk, USA with support from singer/songwriter Alessi Laurent-Marke. Soulful indie singer-songwriter from London. The singer-songwriter who hails from London plays his pop and soul originals. Legendary rock guitarist who made his name with Procul Harum in the 60s. Queen keyboardist Spike Edney presents his all-star lineup including Melanie C, 10CC's Graham Gouldman, Madeline Bell, Patti Russo and Kiki Dee. With QUEEN’s musical director and keyboardist Spike Edney. Indie pop-rock quintet from Dingle. Pop with elements of Gypsy-jazz from the French singer, Isabelle Geffroy.